"We'd like to add our thanks to Cadellin for being such a great part of our wedding reception. We were really grateful to you for being so responsive to emails and for being kind enough to meet all of our requests. We loved the music and thought you created a really fun atmosphere for all of our guests." "So many of my guests commented on how much they enjoyed the ceilidh and how good your band and caller were - the music was excellent and you may find a few more enquiries coming your way from people in the village planning future parties!" "Just wanted to say thanks very much for Saturday night, it was really good fun and everyone enjoyed themselves. I've got a feeling we will be seeing you again soon!" "Thank you and your team for Saturday's entertainment. It was exactly as we wished - and appreciated by our friends. Please pass on our thanks to your caller for pitching just right for the age mixture we had." The members of Cadellin met through the Sheffield University Ceilidh Society in the early 2000s, and have all been playing in ceilidh bands since we were at school. We played together in music sessions, CeilidhSoc scratch bands and other bands before going on to form Cadellin a few years later. We play for English ceilidh dancing (or "barn dancing") and take our influences mainly from the traditional and contemporary folk music of England, Wales, France, Belgium, Ireland and Sheffield. Between us we have played for literally hundreds of wedding receptions, birthday parties, social events, public dance series and festivals. This means that we know how to play for both brand new and more experienced ceilidh dancers, and we also know from experience how to ensure a well-planned and enjoyable event. Ceri plays flute and whistle. She also plays with acoustic folk rock band Treebeard. and rock band Haze. Some of the tunes we play are Ceri's own compositions. Ian plays melodeon. He also plays melodeon and one-row accordion with contra dance band Vertical Expression, who play at public dances and festivals across the country, dances with Appalachian dance team Feet First and is a keen ceilidh and contra dancer. 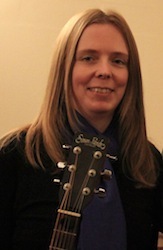 Charley plays guitar and provides the PA and sound engineering. 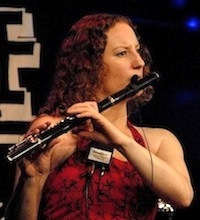 She also plays with contra dance band Vertical Expression, and works as a live sound engineer when she isn't playing for dancing.